Wärtsilä Services supports both the company's marine and power plant customers. Of the existing engine fleet, approximately one quarter is power plant related and the remainder marine industry installations. In terms of Services' revenues, approximately 40% comes from power plant customers and 60% from marine customers. The services portfolio includes everything from spare parts and field service work, to more advanced lifecycle solutions aimed at reducing operational costs and improving efficiency. Roughly half of the Services revenue comes from spare parts, one quarter from field service, and one quarter from service solutions, such as maintenance agreements and service projects. Wärtsilä's installed engine base consists of thousands of installations distributed throughout the world. Services is Wärtsilä's largest business areas, representing 40% of group net sales. The main market driver in the service business is the size and development of the active fleet, which is determined by new equipment deliveries and by the pace at which older installations are taken out of use. The market conditions faced by end customers have a direct impact on the utilisation rate, and the estimated lifetime of installations in operation. In the marine service business, the activity level of the vessel fleet is impacted by the number of anchored and idled vessels, and by the speed at which vessels operate. Lifecycle efficiency drives the Services business in both end markets. The need for lifecycle efficiency solutions comes as a result of changes in, for instance, the cost or availability of different fuels, the cost or availability of crew, and/or the level of technical expertise needed to operate the vessels or power plants. Changes in environmental regulations, as well as improved safety aspects, also influence the need for lifecycle solutions. Lifecycle solutions are offered through long-term service agreements and retrofit projects. The outsourcing of operations and management is today an important trend in the power plants service market. In the future, we believe this will also become a more important driver for the marine markets. Wärtsilä has a strong position in the service market. There is no single competitor with the ability to provide such a broad service offering globally. Only a few smaller global players provide a similar scope of service, and thus competition is mainly local. Wärtsilä Services competes with parts traders, repair yards, local workshops, and component suppliers for spare parts and the field service business. The number of local players is quite large and each product has its own set of competitors. The competition for long-term service agreements for operating power plants comes from a few regional players capable of offering operational services to power plants, including those with different technologies. In the marine market, although some customers handle service and maintenance themselves, a similar scope of service agreements is also offered by ship management companies. Wärtsilä Services cooperates with several companies in this area, offering a variety of options to ensure the best solution for the end user. During 2012, Wärtsilä curated four live webinars, one per quarter, on a series of crucial industry topics. 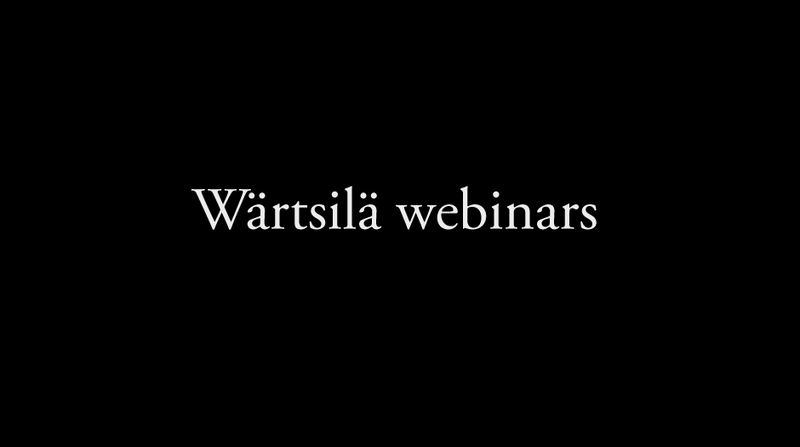 The aim of these webinars was to highlight issues faced by Wärtsilä's customers, open up discussion, and generally enhance the customer interface.